Royal Life Centers at Sound is a premier drug and alcohol addiction aftercare facility located in Lacey, Washington. Our continuing care center in the lush Pacific Northwest was created to connect those overcoming substance use disorders with the best in therapy, case management, and support services. We specialize in treating dependence on alcohol, opioids, benzodiazepines, methamphetamine, and cocaine. 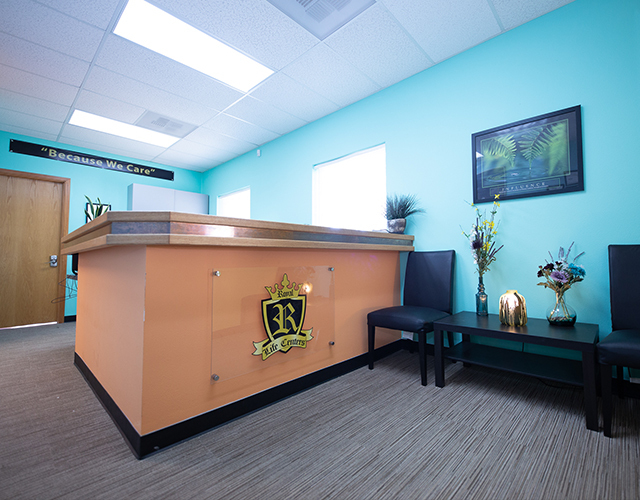 Additionally, we are committed to upholding the highest standard in addiction treatment and guest care. Guests’ well-being and successful recovery is our priority Because We Care. Our therapist’s design treatment plans around each guest’s needs and works one-on-one with each individual. We also ensure that these Individual Service Plans are as personalized and effective as possible. We model our activity, adventure, equine, and other group therapy sessions on the principles of the 12 steps. An approach that we believe best accommodates the diversity of our guests in a collective setting. After completing medical detox at RLC at the Haven (Lacey) or RLC at Puget Sound (Sumner) and residential inpatient treatment at RLC at Puget Sound, guests begin our nine-week outpatient program. This consists of three weeks of PHP and six weeks of IOP— followed by our OP and sober living programs. Our hope is that our holistic programming facilitates skill-building for a new, sober life. Guests at Royal Life Centers at Sound also meet regularly with their assigned case manager. Our trained case managers are here to assist with navigating a variety of legal, employment, as well as social matters. We also work to connect guests with appropriate community resources. Guests live at Royal Life Housing, our sober living facility, for the duration of our nine-week outpatient program. Upon completion and obtaining a job, guests may choose to move on to our grad housing. All Royal Life Housing includes 24/7 staff support, low weekly rent, and amenities such as Wi-Fi and washers and dryers. We hold guests accountable with required meetings and regular drug testing and provide transportation to and from PHP, IOP, and 12 step meetings. Because we understand that guests’ loved ones also need continuing support, we strive to make sure that families feel comfortable. One way we demonstrate our commitment is by providing free drug testing cups to families of guests who have completed a program with us. If you or a loved one has a substance addiction, we hope you’ll consider aftercare with us. Our admissions team is always available at (877)-RECOVERY to speak with you.